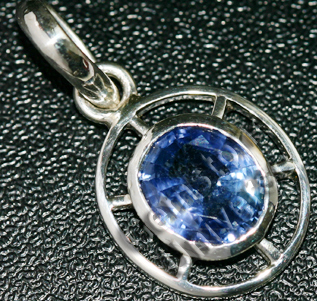 Comments Entry level Jyotish Quality unheated Ceylon Sapphire. We generally do not showcase this quality on our website. If you would be interested in this range please send us a mail directly! Comments What a miracle of Nature. 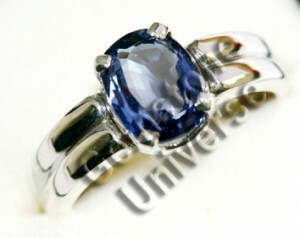 This gemstone having the classic and elegant most sought after rich medium Blue color in Sapphires. What is striking in this gemstone is the similarity in its color with the famous Stuart Sapphire.The Stuart Sapphire is a 104-carat, oval-shaped, cabochon-cut sapphire with a rich medium blue color, and the most preferred color for blue sapphires. 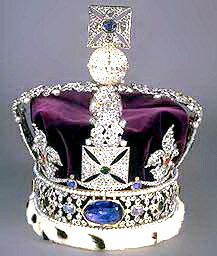 The stone is presently set on the Imperial State Crown of Great Britain, and is one of the historic stones, together with other stones such as the Black Prince’s Ruby and the Edward’s Sapphire, adorning the Crown. This masterpiece was executed in 500 man hours. Both Bangles have been handcrafted with careful attention to minute details. 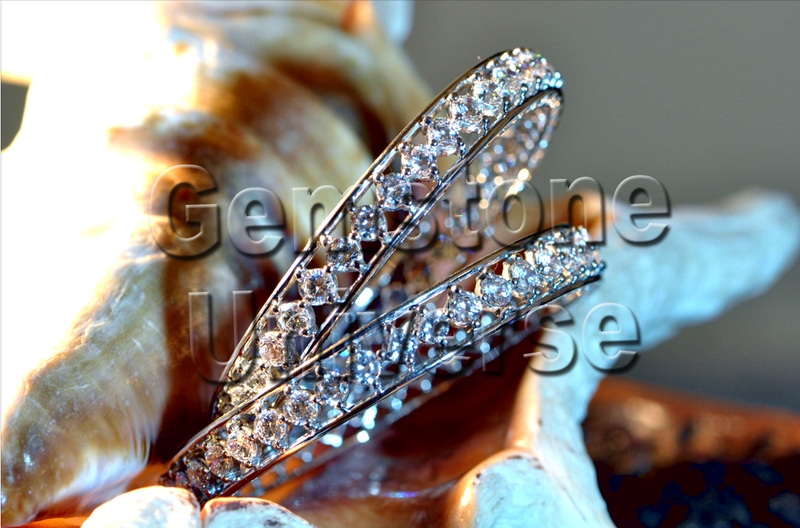 Each Bangle has 39 Diamonds with D color and IF clarity rating for a total of 78 carats of Diamonds set in White Gold. This exquisite and scintillating Bangle is for our very special patron who started Gemstone therapy in the year 1999. 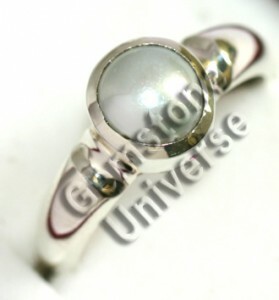 From that time on till now she is a fan of gemology and has today has in-depth knowledge about Gems and gemology. Her friends, relatives and loved ones have benefited from her good counsel and advice. It was a pleasure for us to do the gorgeous and heart warming Venus Talisman that is full of Sattvik Venus energies. Yes, we remember 1999 when you started your therapy with a .68 carat unheated White Sapphire and we will remember these Bangles for these will also be a part of our heritage. Comments A thing of beauty is a joy for ever-John Keats sums this up. There is nothing more to say. Comments Just notice the amazing clarity levels in this Brazilian emerald. 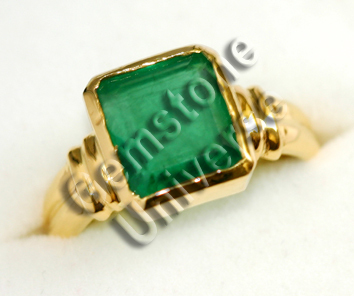 Brazilian Emeralds generally have more harness than Colombian Emeralds and come at 1/6th of the price of a Colombian. Lovely Mercury energies, Guaranteed to deliver results! Majestic & Mysterious Golden Yellow Amber-The healing crystal. Own a piece of History! Huge Baltic Amber Lot of 3000 carats acquired today! Amber is not a crystal neither it is a gemstone. 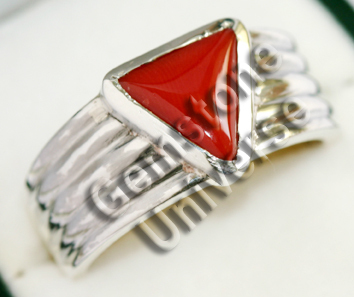 However it is one of the favourite collectible of gemmologists worldwide due to its unique properties. In reality, Amber is petrified pine tree sap that is millions of years Old. Yes, that’s correct-real and natural Amber is millions of years old. In General in most Ambers you will find fossilized remains of insects, plants, flowers, seeds and remnants of prehistoric nature. 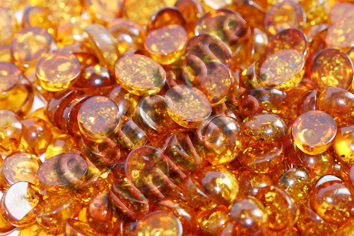 Amber as a gemstone and its use became highly popular after the movie Jurassic Park in which this gem was featured carrying the DNA of Dinosaurs. Amber does not have very strong healing properties. It does however have immense capacity to draw pain and negative energy patterns. It is a gem that heals both the navel and the heart chakra and can be used to remove deep seated complexes, unpleasant events and memories. It is also good in cure of suicidal tendencies, anxiety and depression. 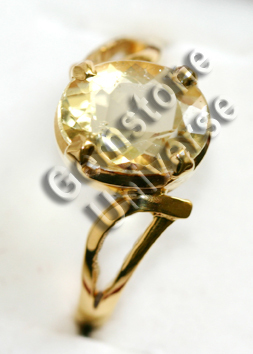 The brilliant Golden Yellow reflection of this mystical gem helps in this process. 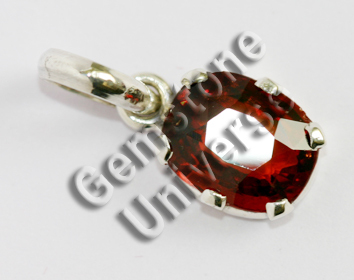 Amber also finds great use in increasing concentration and memory and hence can be used but students and those involved in research work for academic excellence. Students should use it as a Pendant. Owning beautiful Amber that is millions of years old is an added incentive. 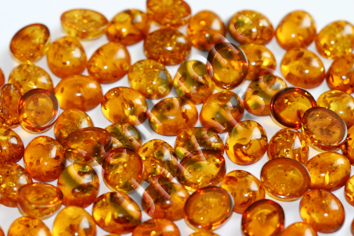 We have acquired a huge lot of 3000 carats of the finest Golden Brown Baltic Amber from Poland today. It is a pleasure to share this picture with you. Individuals interested in procuring Ambers should mail us directly. Very shortly we will be starting a rare collectible section on the website where some of these Ambers will be featured. Did you hear- We have also acquired a 10+ carats single piece of Ceylon Yellow Sapphire today that is unheated and nearly eye clean. Watch this space in the coming days for more. Fiery and Mind blowing Circle of Life Hessonite Pendant. Comments What a stunning beauty. 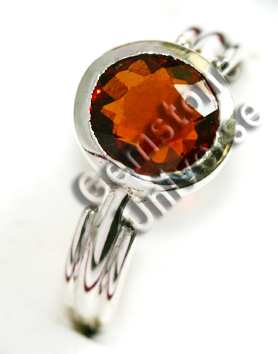 See the fire of this Imperial hessonite it just stops you in your tracks. Amazing miracle of Nature.